Ecolyse provides MicrobeID® Industrial Metagenomics Services, the latest in next generation bacterial identification services. The MicrobeID® service robustly identifies the microorganisms in your system. Informative and meaningful data that can be used to monitor microbial populations to a level of detail never before offered for industrial applications. Determine the ratios of bacteria associated with biocorrosion, biofouling, biofilms, H2S (hydrogen sulfide) production, acid production or other undesirable microbial byproducts. Better monitor biocide application and/or operation efficiency by determining how treatment affects your specific microbial population. Prepare presentations, reports and publications with high quality, robust and meaningful data from your industrial system. Long-term monitoring of your system by tracking the evolving microbial populations over time. The Ecolyse MicrobeID® service utilizes high-throughput, next generation sequencing technologies in order to sequence 16s rRNA PCR products. Between 1,000 and 100,000 PCR products are randomly picked and sequenced from each sample. This number of sequences allows for robust identification of bacteria and archaea that constitute greater than 1% of the total microbial population from each sample. These organisms typically represent 95% to 99% of the microbial types in a system. The microbial source of each of these sequences is identified from a very large database containing 16s sequences from all known bacteria and archaea. The remaining 1% to 5% of the total microbial population is made of types that are present at very low levels, less than 1 individual for every 100 to over 1,000 total individuals in your system. Our basic MicrobeID® reports are given in the form of tables which can easily be converted to pie charts or other graphical methods to view and analyze the results. These show the percent for each bacterial/archaeal genera. This tells you how abundant a specific organism is as compared to the whole population. Additionally, any organism that has been identified as being of particular concern or importance will be flagged. 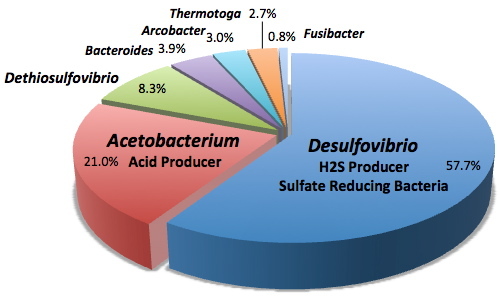 For example, Desulfovibrio will be indicated as being a sulfate reducing bacteria capable of generating hydrogen sulfide that has been found associated with corrosion and reservoir souring. The report will be returned in both a polished PDF format and an editable format if you wish to customize the report. Additionally, the raw files listing each of the individual sequence reads can be provided if desired. For more information or to place an order, please email orders@ecolyse.com with order information or contact information for a call back.